So precious--you can definitely tell Zoey and Camden are siblings! 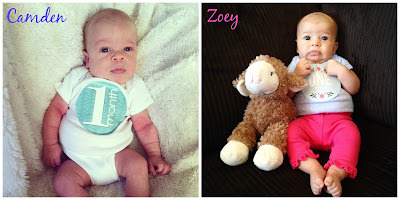 I also love how frowny both of their baby one month photos are--especially knowing that Camden is the smiliest toddler around, I'm guessing Zoey will grow outta that. SO CUTE. I cannot wait to snuggle her little balding head.